Gin and craft beer producer Colonsay Beverages has announced a new vodka which is said to be the first in the UK to be distilled from oats. In order to create the product, the Scottish craft distillery said it had added oats to a refurbished copper pot still along with wheat and rye, resulting in a higher-than-average strength of 43% abv. According to a report in Foodbev, Colonsay Beverages developed the vodka, which is being marketed under the Brochan name, using recipes found in 19th century distillers journals. It describes it as an “exceptionally smooth spirit designed to be sipped and savoured”. 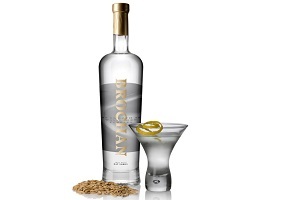 Claimed to be made using Scottish-sourced ingredients, Brochan Oat Vodka will be available in specialist retailers at £35 ($46) per 700ml bottle. Commenting on the launch, Colonsay Beverages head of production Chris Nisbet said: “For a spirit renowned for its neutrality of flavour, we have been astounded by the rich and creamy spirit that the oats help to produce. We have been working with Langley Distillery in the Black Country over the past 12 months to finesse the recipe and are delighted with the results”.